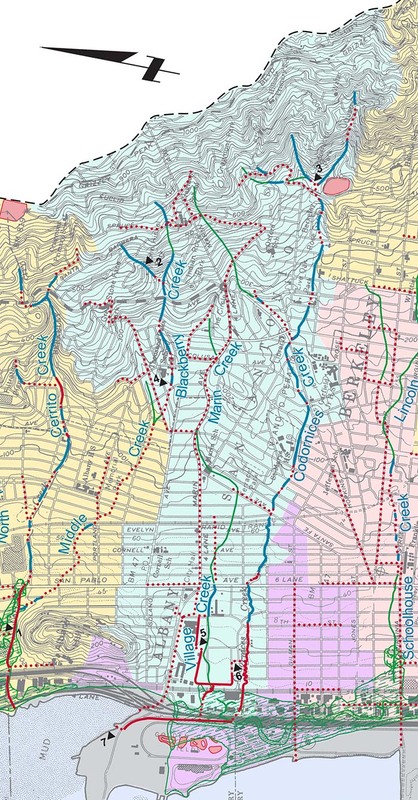 This watershed, shown in green, is highly modified from the natural drainage patterns by the stormdrain network. Marin Creek used to be a tributary of Codornices Creek. Blackberry Creek used to be a tributary of Cerrito Creek. A stormdrain now captures the flows of Blackberry Creek and upper Marin Creek, discharging them from an outfall into the marsh north of Golden Gate Fields. Lower Marin Creek, now called Village Creek, continues to flow into Codornices Creek and they are discharged from a separate outfall into the marsh.